Outward Bound can help move your academic career forward. As the oldest and leading provider of experiential education, high schools and universities across the globe recognize the value of an Outward Bound course. While the Voyageur Outward Bound School is not a degree-granting institution, like a university, we do offer credit-bearing courses through our accredited partners, Western State College of Colorado and Northland College. Additionally, some institutions award academic credit through independent study programs. As with any external study program, the student's home university must approve their program and accompanying transfer credit before the student embarks on the course. See your academic advisor or register for your school's specific policy on transfer credit approval. Upon successful course completion, students receive an official transcript from one of our accredited partners so they may transfer the awarded credit to their university. Click on our partner schools to review their policies and requirements for transfer credit. If you are interested in receiving academic credit, review our Independent Study Guide for Academic Credit (ISG). Please Note: Receiving Academic Credit/preparing an Independent Study requires additional study before, during and after the course. Students must be motivated and take initiative in order to receive academic credit. Call us and let our Admission Advisors know that you would like to use your AmeriCorps Education. Let us know what course(s) you are interested in or let us help you find the right course. We offer courses ranging from four to 75 days. (888) 756-2627. 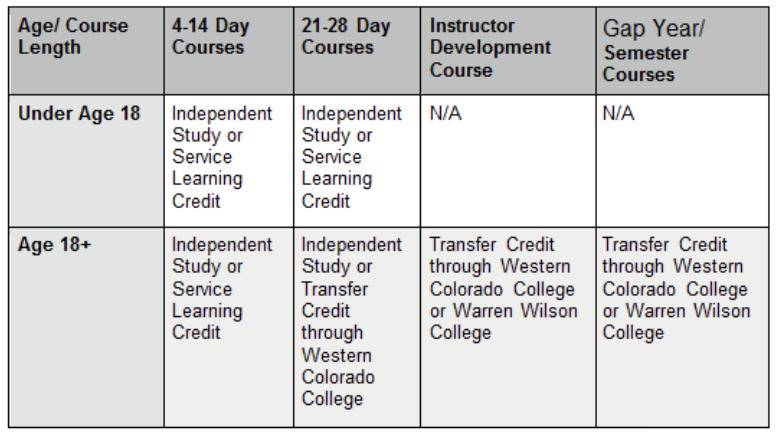 Complete and submit the Western State Colorado University Extended Studies registration packet located here. Note: Western State Colorado University will process your registration within 48 hours and notify Outward Bound. Outward Bound will officially enroll you in your course choice and will contact you to proceed.